Must love a great two-toned kitchen. Right? Because of my new COCOCOZY Color Block rug collection, I am all about the color blocking in home decor this season. About a year ago, my mother had her lower cabinets painted a lovely blue and her upper kitchen cabinets painted white. It is nice to have a mom who is instinctively ‘on trend’! 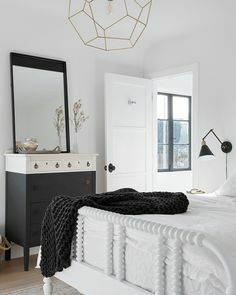 Love the idea of juxtaposing large monochromatic blocks of color in a room. I am doing a room makeover for a girls’ room right now. My little “clients” love pink. I decided to give them a color blocked room with a perfect pink ceiling and white walls. It turned out sooooo cute. So since I am all about two-toned spaces and things…today I bring you 12 stunning two-toned kitchens. Hope you enjoy! This kitchen is perfect. Love the white upper cabinets with brass pulls, the marble tile backsplash and the grey lower cabinets. It all works! Two toned kitchen with neutral on neutral. Love it! Subtle contrast again. Pale green and white on top! Wood toned lower cabinets and island contrast nicely with the lighter counters, backsplash and hood. This one is a little different kind of two toned. A dark grey marble backsplash contrasts with the all white modern kitchen. Which of these looks do you like best? I am liking the neutral on neutral! What other rooms might you color block?